A Sticky Post is the post will be placed at the top of the front page of posts. 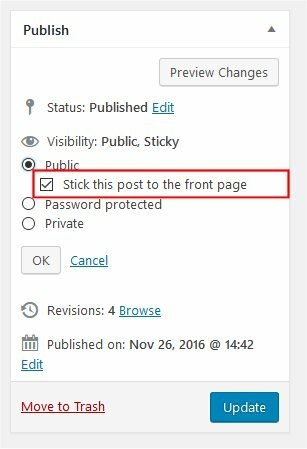 This feature is only available for the built-in post type post and not for custom post types. Note: Use get_query_var( ‘page’ ) if you want this query to work in a Page template that you’ve set as your static front page. The post_class() outputs the class=”whatever” piece for that div. This includes several different classes of value: post, hentry (for hAtom microformat pages), category-X (where X is the slug of every category the post is in), and tag-X (similar, but with tags). It also adds “sticky” for posts marked as Sticky Posts.